The morning of January 15th, 2006 was a slow one. During the Rut, our hunting camp sleeps in. The bucks are moving all day, no reason to wake up just to fall asleep again in your tree stand until 10:00AM! All of us dispersed into our desired waterhole positions around 9:30AM. I went to my waterhole that I made my establishment at the afternoon before. Approaching my spot, my Father and I jumped two large Coues Whitetail on our quads. The first signs of movement were confirmed. I parked my quad about mile from my waterhole. When I approached the waterhole, I sprayed Estrous scent on several trees around the waterhole before I made my way up the tree. Once I was up in the tree, I sprayed more Estrous on small limbs surrounding my tree stand to help cover my scent. With my bow on my lap and my Primos buck call in my hand, I started calling using the Young Buck setting and grunting every 10 minutes. The wind was coming from my 6 at 30+ MPH. After 40 minutes of grunting and smelling like a petting zoo, I heard the breaking of dead Ponderosa branches to my left. I turned to look at what caught my attention, and there were two Does, and one huge Buck 3 feet behind them. After my heart rate slowed down below 220 beats per minute, I waited for the Buck to Quarter away from me of turn broadside for me to take a shot. The day before, I marked every tree with my rangefinder, therefore; I knew the yardage of every tree in front and around me. The Buck was exactly 30 yards to my left. The Does caught wind of the Estrous around the waterhole and started to head back down the canyon that was behind me. 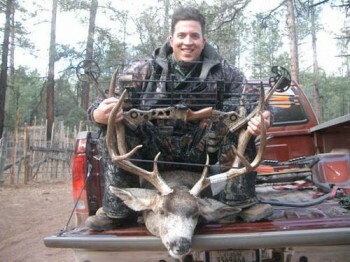 The Buck turned around as well towards the canyon to follow the Does, and I drew the Matthews back. Only 3 seconds after drawing my bow, I had the 30 yard sight pin right on his diaphragm. I let the shot go, and knew I made the most prefect shot I have ever made. I watched the bright orange fletching disappear in his chest. The Buck ran! I almost passed out from the excitement as I watched him run back down the canyon. After 10 minutes of wondering what the hell just happened, I climbed out of the tree stand and walked to where the Buck was standing when I shot him. I found my arrow stuck in a small pine tree about 6 feet on the other side of where he was standing when I shot him. The arrow was dripping blood, and thats when I knew it was all over. I started on his blood trail, and 50 yards from where I shot him, he was down. The excitement of killing my first Buck, and a Buck that big: UNBELIEVABLE!!!!!!!!!!!! !